I'm not a gamer but I was intrigued about this book. It is the source of inspiration for The Witcher, an incredibly popular computer game. 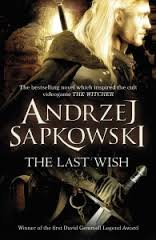 Written by Polish author Andrzej Sapkowski it is the first of two books which are a series of short stories linked cleverly together. The Last Wish is the first book in the series. The Witcher is a fighter, Geralt from Rivia, who earns his crust by ridding the world of monsters. The Last Wish is certainly fast paced and packed full with tales of many wondrous and macabre creatures such as strigas, vampires, evil genies and tempestuous sorcerers. Inside this delightful book you'll recognise many of the fairy tales but they won't be as you remember them from your childhood. The people and monsters in this book are not what they seem. Sometimes it is the humans that are the worst creatures of all. You'll be surprised at where your sympathies lay. You would expect Geralt to be a cold blooded killer intent on bloodshed and annihilation, who's only in the killing business for the money, but you'd be wrong. The Witcher is an intelligent thoughtful man, one who's considerate enough to weigh all options and find the best solution for all involved. He's also incredibly witty and at times incredibly funny. The setting is perfect and has a real eastern European feel to it, immediately you'll feel right at home in The Last Wish. There's very little tedious details and info dumping, Sapkowski is incredibly creative with his world building. From an aspiring writer's point of view I really felt like I learnt a lot about writing from reading Sapkowski's The Last Wish. He's a master at telling back story and advancing the plot through dialogue alone whilst keeping the story fast paced and captivating. These are one of those annoying books that you can't put down. There's already been a television series and film adaptation of these books in Poland which unfortunately did not have great reviews. A great shame, but hopefully due to the massive success of the computer game and also, credit due to the excellent television series Game of Thrones which is opening the door to more great fantasy television and film adaptions, it may get remade. Fingers are crossed! The great thing is if you read this book and love it as it deserves to be, there are many other novels by Sapkowski. There's a sequel to The Last Wish titled The Sword of Destiny, also a short story collection. Following on from these short story collections there are three novels featuring Geralt of Rivia these are: Blood Of Elves, Time of Contempt and lastly Baptism of Fire. Personally I can't wait to read them all.